Oneida Hall is one of four residence halls located on West Campus and it opened in 1970. 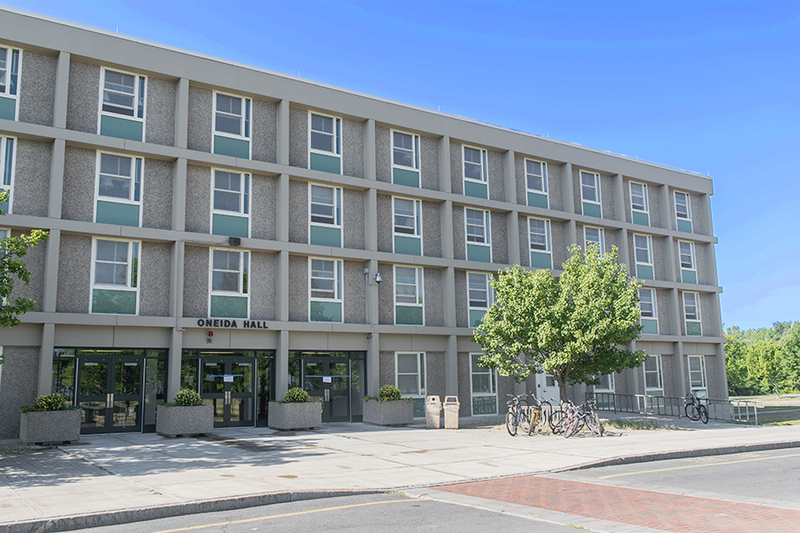 Visually, it resembles Cayuga Hall from the outside, but the layout is centered on each floor’s bathrooms, instead of courtyards like in Cayuga. True to form for a West Campus residence hall, Oneida Hall borrows the name of the Oneida Nation of the Iroquois Confederacy. The history of the Oneida Nation predates the settlement of New York by the English and at one point, the Oneida occupied more than 5 million acres of land, from the Susquehanna River to the St. Lawrence. Today, their land is comprised of more than 13,000 acres spread between Oneida and Madison Counties.